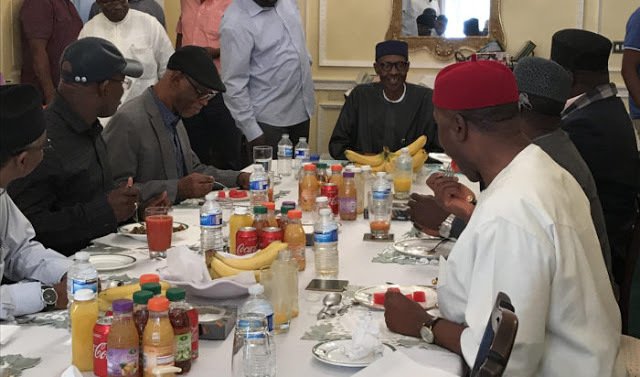 Finally some truth as regards the state of President Buhari’s health has emerged as he dined with APC governors in London. The President was rumored to have been bed-ridden which resulted to many asking that a proof be released to show that the reports are false and on Sunday a report was released that moved to squash such rumors. President Buhari’s special adviser on media and publicity, Femi Adesina shared reports of a telephone conversation he had with Governor Rochas Okorocha of Imo State, who was amongst the Governors that visited President Buhari in London. London Sunday, Governor Rochas Okorocha of Imo State, said the President was very cheerful and has not lost any bit of his sense of humour.